People walk underneath the banners of Fatah and the Palestinian flags inside the Bourj al-Barajneh Palestinian refugee camp in Beirut, Lebanon, May 4, 2017. Ahmad Dawoud recalls the day 10 years ago when a Lebanese soldier asked to search his taxi. Then 17, the Palestinian didn't wait for the soldier to find the weapons hidden in the trunk. Although he was released without a conviction, he couldn't erase the biggest strike against him: As a Palestinian in Lebanon, he is a stateless, second-class resident in the only country where he's ever lived. 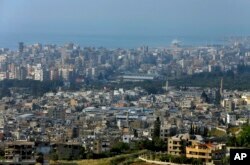 A general view, foreground, of the Ein el-Hilweh Palestinian refugee camp near the southern port city of Sidon, Lebanon, May 5, 2017. "Our lot is less than zero," Dawoud said in a recent interview outside Ein el-Hilweh, the crowded camp in Sidon that is one of the most volatile. On peaceful days, children play in the damp alleys and merchants park their carts of produce along the camp's main streets. Last month, 10 people were killed in a flare-up that drove out thousands of the camp's estimated population of 75,000. They pay into Lebanon's social security fund but receive no benefits. Medical costs are crippling. And they have little hope for remediation from the Lebanese courts. Doctors are prohibited from working in the Lebanese market, so they find work only in the camps or agree to work for Lebanese clinics off the books, and sign prescriptions under Lebanese doctors' names. That leaves them open to employer abuse, a condition normally associated with low-skill work. "If a young boy gets in trouble because he is Palestinian, the prosecutor writes in his note to the judge, `He is Palestinian,' meaning: `Do what you wish to him. Be cruel to him. Forget about his rights,"' said Sheikh Mohammad Muwad, a Palestinian imam in Sidon. The crush of war refugees from Syria has made it even harder for Palestinians here to find work. Nearly six in 10 under age 25 are unemployed, according to the U.N.'s Palestinian relief agency UNRWA, and two-thirds of all Palestinians here live below the poverty line. UNRWA country director Claudio Cordone said they feel trapped in political limbo and see an "almost total lack of meaningful political prospects of a solution" to their original displacement from Palestine. "They starve us, so we go back to Palestine. They deprive us, so that we go back to Palestine. Well, go ahead, send us back to Palestine! Let us go to the border, and we will march back into Palestine, no matter how many martyrs we must give," Muwad said. This has helped fuel the rise of radical Islam - a shift in the occupied Palestinian territories that is reflected by Hamas' rising popularity, and one outside the territories in the meteoric trajectory of militant groups such as Fatah al-Islam in the volatile and deprived Nahr al-Bared camp. "They were the only ones who seemed honest," he said. "Of course, later I figured out they were just like everyone else, too." By that time, Dawoud already was in Ein el-Hilweh, and his arrest was the beginning of a slow falling out with the gangs that once sheltered him and treated him like a brother. After his stint in prison, they began to feel they couldn't trust him, and he was chased out of Ein el-Hilweh in 2013. Now, he can only enter the parts of the settlement firmly under PLO control. With no job, no prospects and little wealth, Dawoud now runs errands for others in his white 1980s-era BMW - all done under the table, of course. Palestinians cannot apply for the red license plates that identify taxis and other commercial vehicles. "I don't even think about marrying and getting into those situations," he said, waving off starting a family at age 27. His ambition now is to apply for a visa to leave Lebanon. But first he needs a travel document, and for that he needs to be on good terms with the Lebanese authorities. "The problem isn't finding vacancies," Hussein said. "It's getting the job."